HB Cooks: Super Bowl Preview! With the Super Bowl only eight days a way, it's time for me to set the menu. I'm going to go with some of my old favorites this year and try a few new recipes. Meatball Parmigiana Sliders- I found this recipe in the January issue of Real Simple magazine. It looks great! Baked Pecan Chicken Wings- These sound yummy and a nice change from regular buffalo wings! Football-shaped vanilla cake with chocolate buttercream frosting- I bought this pan during my cake decorating class days with the super bowl in mind. 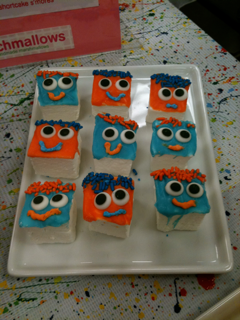 I'm going to keeping the decorating simple and use pre-made icing for this dessert. On Wednesday I attended an open house at the Entrepreneur Space in Long Island City, Queens. It was amazing. The night not only showcased the great facility, but also the dedicated culinary business owners who use the space. Often described as a "culinary and food incubator," Entrepreneur Space houses a 5,500 square foot kitchen, classrooms, and office space-- all available for rent. A year ago the kitchen was in jeopardy as funding dried up and its operator-- the Consortium for Worker Education-- could no longer afford to lease the space. That's when the Queens Economic Development Corporation (QEDC) stepped in and offered a financial and operational lifeline. Over 95 businesses use the space now, representing a variety of culinary ideas. Some of the owners whom I spoke with during the open house had recently experienced job layoffs, while others were going through career transitions, or simply following their dreams. Many praised the space for its affordability and business support services. QEDC hopes to open more of these facilities in the future across the city. This weekend as I finally took down the Christmas tree, I was reminded of when the holiday season was just beginning not so long ago. Early in December I was invited to attend a tree-decorating brunch at which the hosts were serving up waffles and baked ham, and the guests were asked to bring their favorite side dishes. After racking my brain as to what unique food I could contribute to the meal, I imagined some warm and comforting hash browns. Then I took one culinary step further and pictured some golden latkes. Latkes are a form of potato pancake traditionally served by Jews during Hanukkah, often with apple sauce or sour cream (not ham, I know!). 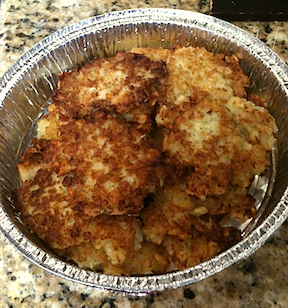 Even though I have Jewish roots in my family, I had never attempted to make homemade latkes. 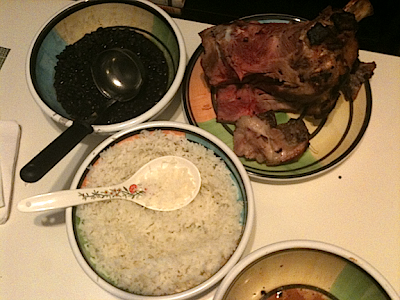 I consulted a few sources for authentic recipes and my friend Mike offered me his mother’s recipe. Score! The recipe was fairly simple, although I found that draining the potatoes does takes some patience to do it well. I didn’t have any matzo meal available, so I used flour as suggested. The latkes were light and crispy and a huge hit at the party. They disappeared almost instantly and no one could believe it was the first time that I had made them. My only regret was not making a double batch! Thanks again Mike! quarter inch thick with oil). Turn when edges are brown. Isabella's restaurant on the Upper West Side of Manhattan is one of my all time favorite New York restaurants. The ambiance is cozy and romantic, and the food is simple yet elegant. It's been a while since i made a trip to Isabella's, but I often think about two dishes that I love there-- the hay and straw pasta with chicken and the dark chocolate bag dessert. A few months ago I was excited to find this hay and straw pasta recipe online and tried to recreate the dish. Unfortunately, I started my grocery shopping after a long day of work and then had to go to 5 markets to find all of the correct items. Although I did learn a lot about my neighborhood shops, I was not a happy camper, especially when I got home and still had to cook everything! Therefore, i suggest planning ahead for this recipe. 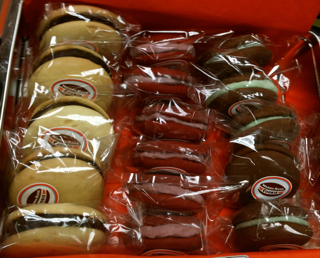 This time around it only took one market trip to gather the ingredients. I used dry pasta instead of fresh for convenience, and combined the pasta with the sauce before serving to avoid clinging noodles. I have found that peeling tomatoes is next to impossible unless you blanch them for a minute or two first (you can use the boiling pasta water). 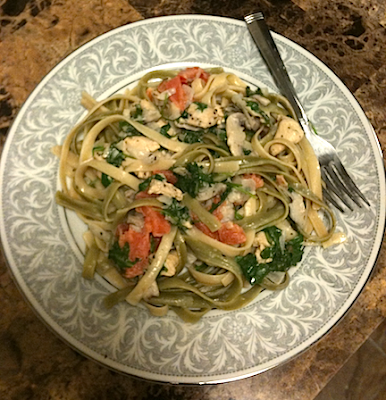 The food turned out awesome, and from what I remember the dish was just as tasty as the original. One day in the future I will try to conquer that chocolate bag, or perhaps go back to the restaurant and get the real one! Yum. 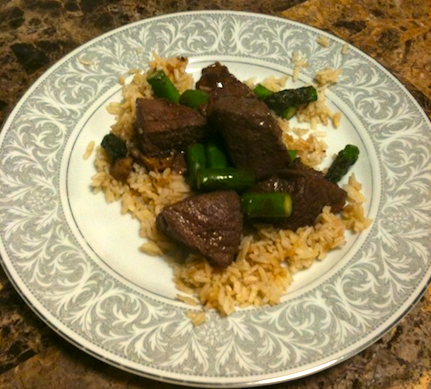 Last night I was really tired, but instead of ordering in I made a quick beef stir-fry with shiitake mushrooms and asparagus over brown rice. The flavors were good, but the beef turned out a little chewy. I think that marinating the meat longer, cutting the cubes smaller, or tenderizing beef with a meat mallet prior to cooking, would have helped make this easy dish taste even better! 1. Marinade 1 lb. beef cubes for 30 minutes or more. 4. Add mushrooms. Cook until asparagus is tender and meat is desired doneness. On a cold winter morning nothing beats a warm and friendly diner. Perhaps it’s my Jersey roots, but I just can’t seem to get enough of the comforting booths, energy of the kitchen, open displays of desserts, and the never-ending menus. My go-to diner in Sunnyside, Queens is Pete's Grill. Their breakfast foods are very satisfying, from the specialty omelettes to the french toast, pancakes, and waffles, you can't go wrong. It’s football season, and while I normally host an annual super bowl party, I also enjoy attending other people’s parties leading up to the big event. In honor of Green Bay making the playoffs, my friend Brian slow-roasted pernil, a Puerto Rican pork roast, using this video from the NYT. The pork was very moist and flavorful. It was served with black beans, white rice, and limes. Brian says the key to scrumptious pork is buying a fatty cut and cooking at a lowest temp possible given your time restraints. Even 200 degrees isn't too low if you have the time. Thanks Brian! 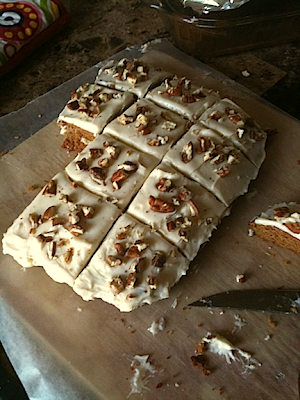 For dessert I whipped up a batch of spiced pecan pumpkin bars with cream cheese frosting. These sweet treats are incredibly easy to make thanks to a Williams Sonoma mix. Unfortunately the pumpkin mix just went out of stock, but the carrot spice mix is still available and gets a number of good reviews. 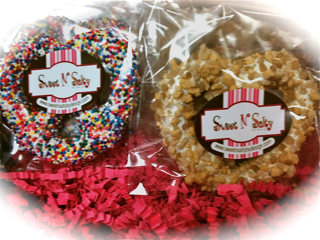 For an extra special touch, add roasted pecans on top. Bake a handful of nuts on a baking sheet for six minutes on 350 degrees, cool, and crush. Be careful not to burn. Add crushed pecans after bars are frosted. For a store bought look, buy some cheap tin containers from the discount store and cut to size. Enjoy!